AX1084 is a low dropout positive adjustable or fixed-mode regulator with minimum of 5.0A output current capability. The product is specifically designed to provide well-regulated supply for low voltage IC applications such as high-speed bus termination and low current 3.3V logic supply. AX1084 is also well suited for other applications such as VGA cards. 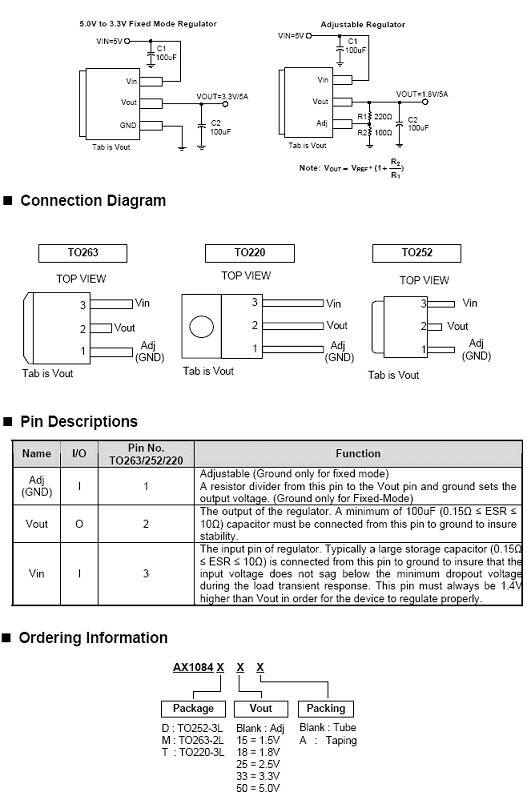 AX1084 is guaranteed to have lower than 1.5V dropout at full load current making it ideal to provide well-regulated outputs of 1.25V to 3.3V with 4.8V to 12V input supply.